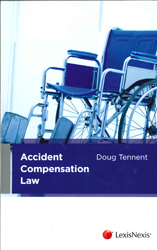 Accident Compensation Law - ubiq bookshop: the best place to buy books! This text outlines the operation of the ACC regime, identifies the difficulties and issues which arise for people when requiring ACC assistance and advises on how to best address these difficulties. It has a practical focus but also necessarily includes some policy aspects in order to best contextualize the practical. Featured in the 7 January 2013New Zealand newsletter. Featured in the January 2013 Law newsletter.